A bungalow (from Hindi बंगला, "bangala") is a type of building, originally developed in the Bengal region of the subcontinent. The meaning of the word bungalow varies internationally. Common features of many bungalows include verandas and being low-rise. In Australia, the California bungalow associated with the United States was popular after the First World War. 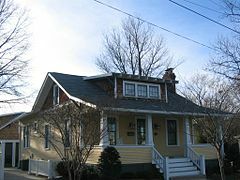 In North America and the United Kingdom, a bungalow today is a house, normally detached, that may contain a small loft. It is either single-story or has a second story built into a sloping roof, usually with dormer windows (one-and-a-half stories). The bungalow style house in Bangladesh, locally known as Banglaghar. The term originated in the Indian subcontinent, deriving from the Hindi word "बंगला" (baṅgala), meaning "Bengali" and used elliptically for a "house in the Bengal style". This Asian architectural form and design originated in the countryside of Bengal region in the Indian subcontinent. Such houses were traditionally small, of one story and detached, and had a wide veranda. The term was first found in English from 1696, where it was used to describe "bungales or hovells" in India for English sailors of the East India Company. Later it became used for the spacious homes or official lodgings of officials of the British India, and was so known in Britain and later America, where it initially had high status and exotic connotations. The style began to be used in the late 19th century for large country or suburban residential buildings built in an Arts and Crafts or other Western vernacular style—essentially as large cottages, a term also sometimes used. Later developers began to use the term for smaller buildings. Bungalows are very convenient for the homeowner in that all living areas are on a single-story and there are no stairs between living areas. A bungalow is well suited to persons with impaired mobility, such as the elderly or those in wheelchairs. 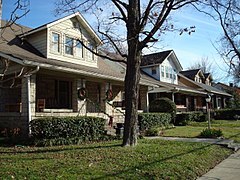 Neighborhoods of only bungalows offer more privacy than similar neighborhoods with two-story houses. As bungalows are one or one and a half stories, strategically planted trees and shrubs are usually sufficient to block the view of neighbors. With two-story houses, the extra height requires much taller trees to accomplish the same, and it may not be practical to place such tall trees close to the building to obscure the view from the second floor of the next door neighbor. Bungalows provide cost-effective residences. On the other hand, even closely spaced bungalows make for quite low-density neighborhoods, contributing to urban sprawl. In Australia, bungalows have broad verandas to shade the interior from intense sun. But as a result they are often excessively dark inside, requiring artificial light even in daytime. On a per unit area basis (e.g. per square meter or per square foot), bungalows are more expensive to construct than two-story houses, because a larger foundation and roof area is required for the same living area. The larger foundation will often translate into larger lot size requirements, as well. Due to this, bungalows are typically fully detached from other buildings and do not share a common foundation or party wall: if the homeowner can afford the extra expense of a bungalow relative to a two-story house, they can typically afford a fully detached property as well. In rural Bangladesh, the concept is often called Bangla ghar ("Bengali Style House") and remain popular. Today's main construction material is corrugated steel sheets or red clay tiles, while past generations used wood, bamboo, and khar straw. This straw was used to form roofs, keeping the house cooler during hot summer days. From 1891 the Federation Bungalow style swept across Australia, first in Camberwell, Victoria, and through Sydney's northern suburbs after 1895. The developer Richard Stanton built in Federation Bungalow style first in Haberfield, New South Wales, the first Garden Suburb (1901), and then in Rosebery, New South Wales (1912). Beecroft, Hornsby and Lindfield contain many examples of Federation Bungalows built between 1895 and 1920. From about 1910 until 1930, the California Bungalow style was very popular in Australia and New Zealand. The style seems to have first been imported in Sydney and then spread throughout the Australian states and New Zealand. In South Australia, the suburb of Colonel Light Gardens contains many well-preserved bungalow developments. The first two bungalows in England were built in Westgate-on-Sea in 1869 or 1870. A bungalow was a prefabricated single-story building used as a seaside holiday home. Manufacturers included Boulton & Paul Ltd, who made corrugated iron bungalows as advertised in their 1889 catalogue, which were erected by their men on the purchaser's light brickwork foundation. Examples include Woodhall Spa Cottage Museum, and Castle Bungalow at Peppercombe, North Devon, owned by the Landmark Trust; it was built by Boulton and Paul in the 1920s. Construction of this type of bungalow peaked towards the end of the decade, to be replaced by brick construction. Bungalows became popular in the United Kingdom between the two World Wars and very large numbers were built, particularly in coastal resorts, giving rise to the pejorative adjective, "bungaloid", first found in the Daily Express from 1927: "Hideous allotments and bungaloid growth make the approaches to any city repulsive". Many villages and seaside resorts have large estates of 1960s bungalows, usually occupied by retired people. The typical 1930s bungalow is square in plan, with those of the 1960s more likely to be oblong. 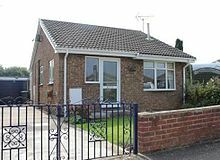 It is rare for the term "bungalow" to be used in British English to denote a dwelling having other than a single storey, in which case "chalet bungalow", (see below) is used. The bungalow is the most common type of house built in the Irish countryside. During the Celtic Tiger years of the late 20th century, single-storey bungalows declined as a type of new construction, and residents built more two-storey or dormer bungalows. There was a trend in both the Republic of Ireland and Northern Ireland of people moving into rural areas and buying their own plots of land. Often these plots were large, so a one-storey bungalow was quite practical, particularly for retirees. 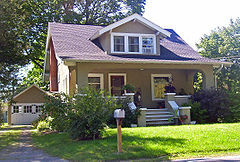 Canada uses the definition of bungalow to mean a single-family dwelling that is one storey high. 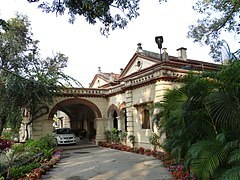 In India, the term bungalow or villa refers to any single-family unit, as opposed to an apartment building, which is the norm for Indian middle-class city living. The normal custom for an Indian bungalow is one storey, but as time progressed many families built larger two-storey houses to accommodate humans and pets. The area with bungalows built in 1920s–1930s in New Delhi is now known as Lutyens' Bungalow Zone and is an architectural heritage area. In Bandra, a suburb of India's commercial capital Mumbai, numerous colonial-era bungalows exist; they are threatened by removal and replacement of ongoing development. In a separate usage, the dak bungalows formerly used by the British mail service have been adapted for use as centers of local government or as rural hostels. 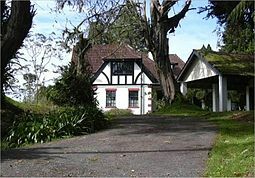 In Singapore and Malaysia, the term bungalow is sometimes used to refer to a house that was built during the colonial era. The structures were constructed "from the early 19th century until the end of World War II." They were built by the British to house their "military officers, High Court judges and other members of the colonial society's great and good." 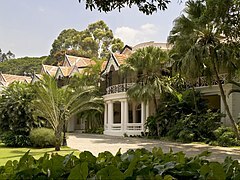 At present, there is still a high demand for colonial-era bungalows in Singapore and Malaysia. Most of the units are used as residences. Over the years, some have been transformed into offices, hotels, galleries, spas and restaurants. In the post-colonial period, the term bungalow has been adapted and used to refer to any stand-alone residence, regardless of size, architectural style, or era in which it was built. Calling a house a bungalow often carries with it connotations of the price and status of the residence, and thus the wealth of its owner. Local real estate lingo commonly includes the word "bungalow" when referring to residences that are more normally described as "detached", "single-family homes", or even "mansions" in other countries. The pervasiveness of the word in the local jargon has resulted in bungalow being imported into the Malay language as the word banglo with the same meaning. In South Africa, the term bungalow never refers to a permanent residential building but means a small holiday residence, a small log building, or a wooden beach hut. In Germany a single storey house with a flat roof is referred to as a bungalow. The height of this building style was during the 1960s. The two criteria are mentioned in contemporary literature e.g. Landhaus und Bungalow by Klara Trost (1961). 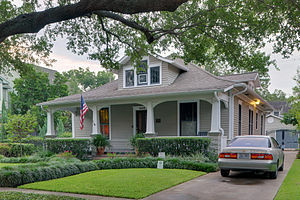 The American Craftsman bungalow typified the styles of the American Arts and Crafts movement, with common features usually including low-pitched roof lines on a gabled or hipped roof, deeply overhanging eaves, exposed rafters or decorative brackets under the eaves, and a front porch or veranda beneath an extension of the main roof. Sears Company and The Aladdin Company were two of the manufacturing companies that produced pre-fab kits and sold them from catalogues for construction on sites during the turn of the 20th century. A special use of the term bungalow developed in the greater New York City area, between the 1930s and 1970s, to denote a cluster of small rental summer homes, usually in the Catskill Mountains in the area known as the Borscht Belt. First- and second-generation Jewish-American families were especially likely to rent such houses. The old bungalow colonies continue to exist in the Catskills, and are occupied today chiefly by Hasidic Jews. 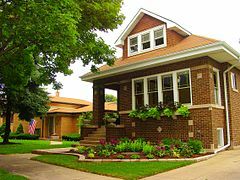 The California bungalow was a widely popular ​1 1⁄2-story variation on the bungalow in the United States from 1910 to 1925. It was also widely popular in Australia within the period 1910–1940. A bungalow with loft has a second-storey loft. The loft may be extra space over the garage. It is often space to the side of a great room with a vaulted ceiling area. The building is still classified and marketed as a bungalow with loft because the main living areas of the house are on one floor. All the convenience of single-floor living still applies and the loft is not expected to be accessed on a daily basis. Some have extra bedrooms in the loft or attic area. Such buildings are really one-and-a-half storeys and not bungalows, and are referred to in British English as "chalet bungalows" or as "dormer bungalows". "Chalet bungalow" is also used in British English for where the area enclosed within pitched roof contains rooms, even if this comprises a large part of the living area and is fully integrated into the fabric of the property. True bungalows do not use the attic. Because the attic is not used, the roof pitch can be quite shallow, constrained only by snow load considerations. The majority of Chicago bungalows were built between 1910 and 1940. They were typically constructed of brick (some including decorative accents), with one-and-a-half stories and a full basement. With more than 80,000 bungalows, the style represents nearly one-third of Chicago's single-family housing stock. One primary difference between the Chicago bungalow and other types is that the gables are parallel to the street, rather than perpendicular. Like many other local houses, Chicago bungalows are relatively narrow, being an average of 20 feet (6.1 m) wide on a standard 24-foot (7.3 m) or 25-foot (7.6 m) wide city lot. Their veranda (porch) may either be open or partially enclosed (if enclosed, it may further be used to extend the interior rooms). There are numerous examples of Arts and Crafts bungalows built from 1910 to 1925 in the metro-Detroit area, including Royal Oak, Pleasant Ridge, Hazel Park, Highland Park and Ferndale. Keeping in line with the principles of the Arts and Crafts movement, the bungalows were constructed using local building materials. A large fraction of the older residential buildings in Milwaukee, Wisconsin, are bungalows in a similar Arts and Crafts style to those of Chicago, but usually with the gable perpendicular to the street. Also, many Milwaukee bungalows have white stucco on the lower portion of the exterior. A bungalow built on stilts in a tropical lagoon was first built in 1967 by a resort operator who did not have beach front property and has since become an iconic symbol of tropical vacations. A raised bungalow is one in which the basement is partially above ground. The benefit is that more light can enter the basement with above ground windows in the basement. A raised bungalow typically has a foyer at ground level that is halfway between the first floor and the basement. Thus further has the advantage of creating a foyer with a very high ceiling without the expense of raising the roof or creating a skylight. Raised bungalows often have the garage in the basement. Because the basement is not that deep, and the ground must slope downwards away from the building, the slope of the driveway is quite shallow. This avoids the disadvantage of steep driveways found in most other basement garages. Bungalows without basements can still be raised, but the advantages of raising the bungalow are much less. A ranch bungalow is a bungalow organized so that bedrooms are on one side and "public" areas (kitchen, living/dining/family rooms) are on the other side. If there is an attached garage, the garage is on the public side of the building so that a direct entrance is possible, when this is allowed by legislation. On narrower lots, public areas are at the front of the building and such an organization is typically not called a "ranch bungalow". Such buildings are often smaller and have only two bedrooms in the back as required. The term ultimate bungalow is commonly used to describe a very large and detailed Craftsman-style house in the United States. The design is usually associated with such California architects as Greene and Greene, Bernard Maybeck, and Julia Morgan. ^ Stevenson, Angus (19 August 2010). Oxford Dictionary of English. OUP Oxford. ISBN 9780199571123. ^ Oxford English Dictionary, unless "hovells" meant haveli rather than the English word "hovel". ^ First cited use of a building in Britain by the OED in 1903. ^ Mallory, Keith (1985). The Bristol House. Redcliffe Press Ltd. ISBN 0905459997. ^ Mornement, Adam; Holloway, Simon (2007). Corrugated Iron: Building on the Frontier. W. W. Norton & Company. p. 50. ISBN 9780393732405. Retrieved 9 January 2019. ^ "Benchmark Home Definitions" (PDF). Canadian Real Estate Association. Retrieved 23 August 2017. ^ Davison, Julian (2006). Black and White: The Singapore House 1898–1941. Talisman Publishing Pte Ltd. ISBN 981052739X. ^ "Black and whites draw many expats". The Straits Times. 14 October 2011. p. B22. ^ "Table Talk: Singapore's This Old House". The New York Times. 23 September 2007. p. 618. ^ Trost, Klara (1961). Landhaus und Bungalow. Frankfurt am Main, West-Germany: Ullstein Fachverlag. ^ Rockett, Darcel (14 January 2019). "'These Homes Represented the American Ideal': How Chicago Bungalow Owners Cherish – and Renovate – Their Historic Houses". Chicago Tribune. Retrieved 20 January 2019. ^ Kennedy, Barbara Noe (17 August 2017). "The tropical overwater bungalow — long a symbol of relaxation and luxury — turns 50". The Washington Post. Retrieved 23 August 2017.